Thoughtful architectural renovations combine with peppy interiors to take a historic home in Vestavia Hills to a whole new level of stylish sophistication. 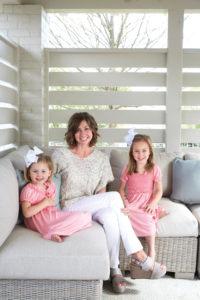 Mary Wyatt and her daughters, Vivi Rose (left) and Mary Evelyn, enjoy spending time in the outdoor room that was also updated in the renovation. Formerly a gazebo with a low ceiling, the space was opened up and gained an outdoor fireplace. 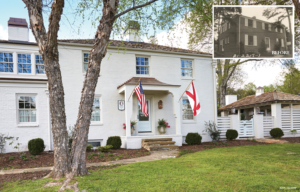 Potential—that was the word that came to mind when Mary Wyatt first stepped into her 1938 home in Vestavia Hills. “It had great character and good bones, and I could even envision it being in a magazine one day!” she says with a laugh. First things first, however—the dark and choppy layout needed revamping, and the home need a little more space. Mary immediately called Paige Sumblin Schnell of Tracery Interiors. “I knew I wanted Paige to do the interiors the minute I bought the house. I love her style, and we have a family connection—my brother is married to her sister, ” says Mary. Even though Mary became the owner of Wyatt General Contractor after her husband, John, passed away in 2015, she enlisted additional help from residential builder Alan Simpson of Ruff Reams, who in turn recommended residential designer Richard Long of Long and Long. The talented, transforming trio was in place. Richard’s plans included adding an inviting front entry and upstairs master suite while reworking the main level. For the interiors, Mary requested happy, comfortable, and uplifting rooms. “When I thought of the word happy, I immediately thought of pink, ” says Paige. 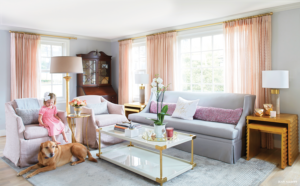 “And it’s all girls in the house now.” The living room shows off sophisticated and subtle shades while the family room sports the bright side of the pink spectrum. The cheerful décor pairs some family antiques with more modern pieces. “Mary and her two girls are young, so I wanted a fun, contemporary vibe, ” the designer says. Along with a glamorous gold floor lamp, shimmering mercury glass, and a white lacquered coffee table, practical elements are in play as well, such as the pale-whitewashed oak floors that flow throughout the downstairs. “We wanted the house to be very pretty but also very livable, ” Paige says. “We envisioned neighborhood kids tramping in and out, so these floors are very forgiving.” Upholstery, slipcovered in Sunbrella outdoor fabrics, speaks to the practical side as well. 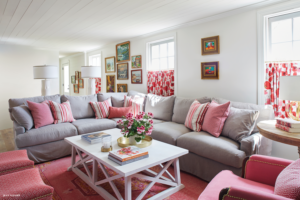 The family den is a play of patterns in florals and stripes with punches of pink throughout. Mary’s collection of paint-by-numbers artwork is proudly displayed in vibrant groupings. “They are so much fun to collect. Each one is a reminder of where I found it or who found it for me, ” says Mary. “Mary already had this dining room table and the ghost chairs, but we added in the curtains and the statement-making chandelier, ” says Paige. 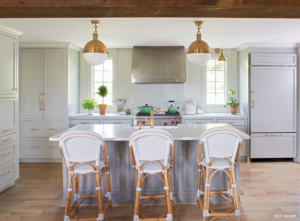 Gold touches continue in the kitchen’s hardware, faucet, and oversized pendant lights but are tempered by the soft gray cabinets and white counters. 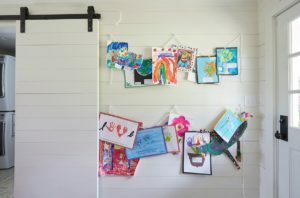 Finding a way to display your children’s artwork can be a challenge. Here, designer Paige Schnell created organized chaos off the kitchen with a haphazard arrangement that is equal parts playful and imaginative. Everyone got a room of her own in the redesign. The girls picked out the brighter colors for their bedrooms, while Mary chose softer tones for the master. Flags seem to celebrate the home’s beautiful front makeover, along with planters full of cheer by Fiore Garden Design. Residential designer Richard Long achieved the “it doesn’t look renovated” goal beautifully. Check out his subtle-yet-impactful changes. FRONT DOOR MAKEOVER The front entrance went from nondescript to welcoming with the addition of a charming entry porch with decorative brackets and a copper-covered hipped roof. DISGUISED ADDITION By positioning the second-floor master suite addition on the back of the house, Richard preserved the roofline and kept the façade intact. OPENED UP KITCHEN Removing a wall and a half bath (“It was more like a quarter bath, ” jokes Richard) between the family room and the kitchen and adding an attractive support beam allows Mary to now keep an eye on the girls while she’s in the kitchen. STORAGE GALORE By reconfiguring the existing space, Richard was able to give Mary a generous butler’s pantry and half bath right off the kitchen. RESTRAINED DESIGN Since the dining and living rooms were intrinsically just fine, Richard left those spaces alone. 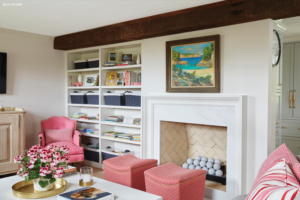 “The home had a lot of history and character, and we didn’t want to lose that.” To enhance the family room, the designers added shiplap siding to the ceiling and walls.